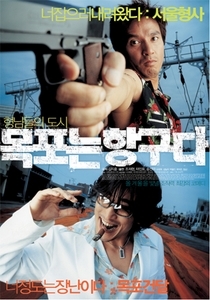 Winning the grand prize at the Yubari International Fantastic Film Festival 2004 in Japan, comedy "Mokpo, Gangster's Paradise" tells the story of a detective who goes undercover to infiltrate a suspected drug ring in the port city of Mokpo. Soo Chul (Cho, Jae-hyun) is an undercover cop in Seung Gee, the gang involving in smuggling drugs. To sneak into the haunt of the gang, Soo Chul meets the gang boss Park, Seung Gee (Cha, In-pyo) who welcomes Soo Chul with severe torture. Enduring the ordeal, Soo Chul is accepted as a junior member. But he then shoots to stardom in the gang when he knocks down a tough opponent in an underground boxing tournament. Can the fame help Soo Chul collect evidence of the drug ring? Director Kim, Ji-hoon's directorial debut "Mokpo, Gangster's Paradise" unfolds a funny story in an interesting good guy versus bad guy perspective.